'Cognitive Cooking with Chef Watson' is a collaboration between IBM and the Institute of Culinary Education in New York City. Once a week, as part of an ongoing series, we'll be preparing one recipe from the book until we've made all of them. Wish us luck. Let's get a couple of things straight: Watson, the IBM supercomputer famous for spanking Ken Jennings on Jeopardy, did not really write these recipes in the purest sense of the word. Rather, IBM trained it by feeding it a giant database of recipes, studies on what flavors and smells people find pleasant and information on the chemical compounds found inside ingredients. Using this, Watson is able to suggest dishes with surprising flavor combinations. From there the computer passes the baton to a human being, in this case James Briscione and Michael Laiskonis from the Institute of Culinary Education (ICE), who use the ingredient lists and style suggestions as inspiration for new dishes. Which brings me to the second point, some of the recipes in this book are complicated, require uncommon kitchen tools and call for hard-to-find ingredients. Cognitive Cooking is as much a showcase for Briscione's and Laiskonis' creativity as it is for the power of Watson. The book is meant to highlight how IBM's machine can enhance human creativity through the power of cognitive computing in general. It's a pitch to trained chefs and professionals across a number of fields, like medicine. It is not necessarily a reference guide for the casual home cook. The first recipe up is Turkish Bruschetta -- a pretty traditional antipasto preparation, but featuring flavors from the crossroads of Mediterranean Europe and the Middle East. It's definitely one of the less intimidating dishes in the book. Most of the ingredients aren't particularly hard to find. Cumin, oregano, basil, scallions... those are all pretty standard. And you can find Japanese eggplants in most Asian food stores or a high-end supermarket like Whole Foods. The two ingredients you probably won't find in your local mega mart: sumac and agar. Sumac is a spice popular in Middle Eastern cuisines that has a slightly tart flavor, while agar is a gelatin-like substance derived from algae. 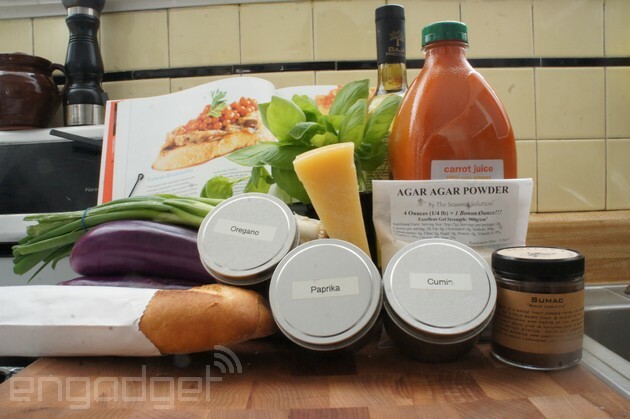 If you have a gourmet food or kitchen supply store nearby, you may find these ingredients. If not, there's always a wonderful thing called the internet. If Watson's goal is to "surprise" you with flavor combinations, then the Turkish Bruschetta might disappoint a little bit (don't worry, the book gets much weirder). There are three major components to the recipe: toasted bread, an eggplant puree and -- the one alarming bit -- "carrot pearls." The puree isn't too far from a baba ganoush. The Parmesan and oregano are slightly unexpected nods to the bruschetta's Italian roots and serve as stand-ins for the tahini and parsley you'd find in a traditional baba ganoush preparation. Basically you roast the eggplant; scoop out the flesh; season it with sumac, paprika and oregano; combine with the cheese, scallion and basil (oh, and of course salt); and process into a delicious paste. It was pretty quick and easy to make, even in the confines of my tiny NYC kitchen. It was the next part that introduced the trouble. So, let's talk about carrot pearls. Apparently the original version of this recipe called for shredded marinated carrot. And I would suggest that any home cooks attempting this recipe seriously consider going that route. But Briscione, known for his modernist techniques, added an extra element of surprise by using agar and carrot juice to create spiced "pearls" that sit on top of the eggplant puree. To create them you simmer the juice with cumin, sumac and salt. Then once the flavors are combined, you whisk in the agar, which acts like gelatin. The instructions then ask you to put this mixture in a squeeze bottle and slowly drip the spiced carrot juice into a bowl of vegetable oil over ice. I'd suggest actually putting the bowl of oil in the freezer for at least an hour beforehand, since what you're trying to do is quickly shock cool the carrot juice to form a thin skin around the bead and a bowl of ice might not be enough. The technique needed is kind of tricky to master, too. I created some nice-looking pearls, but I also ended up with an amorphous blob of orange jelly at the bottom of the bowl. If you happen to have a kitchen syringe, that might actually make a better tool for dispensing the drops of juice. I'll say this, the combination of cumin, sumac and carrots is not something you come across very often. It's plenty surprising on its own. There's no need to drive yourself nuts with "pearls." A few of my taste testers were a little taken aback by the texture of the carrot pearls, but the eggplant puree was an unmitigated success. After scraping the carrot pearls off, a few of my testers went back for seconds and thirds. (And I may have gone back in for fifths...) The final product was tasty, if a little odd. The vegetal sweetness of the carrot and eggplant, the earthiness of the cumin and the slightly sour punch of the sumac combine into something fairly unique. And for that, Watson deserves credit. The most surprising element of the recipe may come from the mind of a human being, but the pleasant and uncommon mix of flavors was generated completely by a computer. If you want to try the recipe yourself, you'll find it below. And we'll be back next week with a new installment. Char the eggplants on a flame until black on all sides, then roast at 350 degrees Fahrenheit until tender. Cook the scallions on a grill until charred on all sides. Split the eggplants, and scoop the flesh out of the eggplant with a spoon, keeping only a little bit of charred skin. You should have about one pound of flesh. Add the sumac, dry oregano, paprika and Parmesan. Sauté in oil over very high heat for one minute, stirring constantly, then transfer to the bowl of a food processor. Add the basil and salt. Blend until smooth. 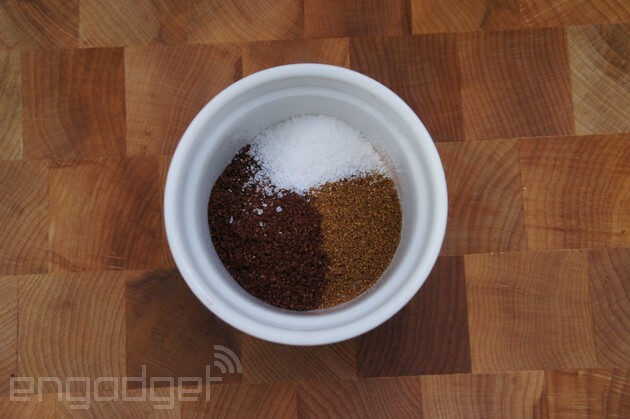 Combine the carrot juice, cumin, sumac and salt in a pot. Bring the mixture to a simmer and cook two to three minutes to develop the flavors. Remove from the heat and cool completely. Strain the carrot juice into a clean pot. Whisk in the agar until dissolved and return the pot to heat. Cook, stirring gently with a spatula, until the mixture comes to a simmer. 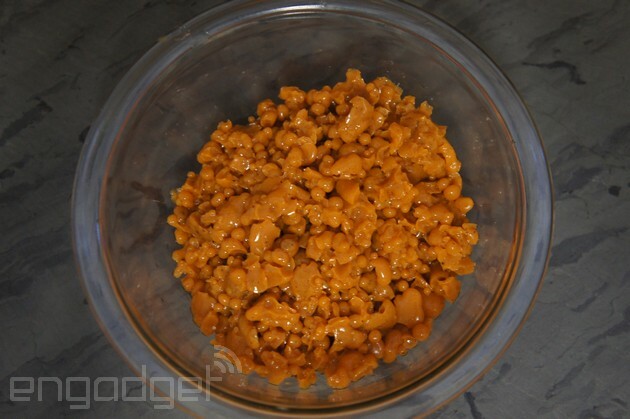 Remove the pot from heat and continue stirring until cooled slightly. Transfer the mixture to a squeeze bottle and slowly drip the carrot juice into the ice-cold oil to form pearls. When they are all formed, drain the pearls from the oil and rinse in cold water. Drizzle sunflower oil over the bread and toast until crispy. 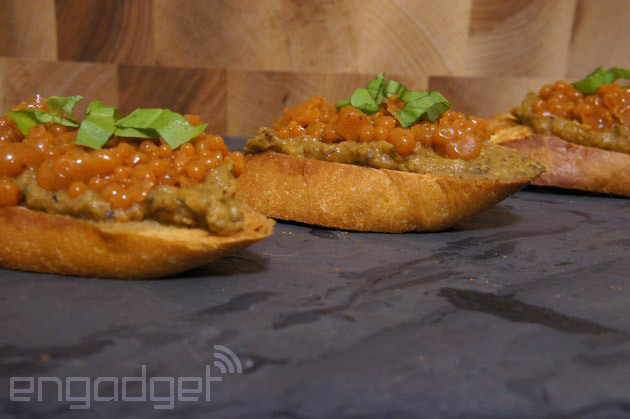 Spread the eggplant puree on the bread slices, then finish with the carrot pearls.